Continuing my simple synth series. Design goals: simple and educational circuit, 9V battery powered. V/Hz with CV output of about 1-5V giving at least two octaves of reasonable linearity. Stripboard layout shown with no cuts required. If you have a 5 or 6V reference voltage already available you can use that instead of C1 and U1. If you are building it into your synth you can use the main power supply instead of the battery and you won't need the stereo socket with the power-on-when-plugged-in earthing arrangement. Multiple output sockets on this can be very handy in a modular synth. Finding suitable tape is the hardest bit. I have tested quite a few video/audio/computer-backup tapes and found that pro-grade tapes from the 80s or earlier are the most likely to be suitable (amongst older pro-grade tapes I found I needed to test about a dozen tapes to find two or three suitable ones). Modern consumer grade VHS is not so likely to be suitable. I think you want somewhere between 10K and 100K per 10cm of tape. Most tapes are more like 1M or more over that distance which is too high to be useful. I have found one oddball that was about 3K per 10cm. One thing to note is that the contact resistance can be quite high. For example if you get a reading of 100K over 10cm, 25K of that might be the probe to tape contact resistances. So 1cm would read about 30K. 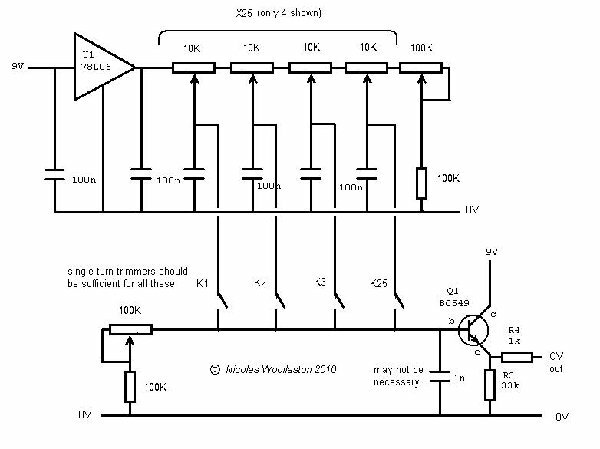 This doesn't usually matter too much with a three wire voltage divider type circuits like this, but will affect the linearity slightly. I have some quarter inch tape from a computer backup cartridge and some half inch tape from professional TV betacam that both give me a reading of just under 100K per 10cm. Both work well with 25-30cm of tape as the ribbon, but the betacam tape seems to wear out much much faster. I stick the tape down with double sided sticky tape. Long and high resistance ribbon controllers are more likely to pick up hum and noise. C3 is there to quite that down, but does slow the response slightly. You may need to adjust the value of C3. Use the smallest value that still kills the noise. You only need to find one tape that works and it will supply you and everyone you know with ribbon controllers for the rest of your life including regular replacements of the ribbon if necessary. So if there is anyone in Christchurch, New Zealand who needs some suitable tape, feel free to contact me. Is it possible to make a thread with the collection of all your current and coming circuits. Or even a subforum? I really like these simple synth circuits. This is awesome! I have a Korg Micro-Preset that is V/Hz that needs to be recased. I tried making a ribbon controller for it before because I dislike the keyboard and wanted to turn it into a ribbon controller based synth. I dug out all my old VHS tapes and out of 30 or 40 I only found one or two that are 10K which seem to work (except not with the Korg, being V/Hz.) Only bad thing is that it was my Peewee Herman's Christmas Special tape! But now I can resurrect this project. I second the motion for a website or single thread with all of your schematics! Information on adapting for standard modular levels/power would be great too. I agree. It would be good to have them all together. I have built the LFO, VCLFO (not tried the cv yet). I have the ADSR ready soon. Think I am going to build the filter as well. doesn't the 13700 work aswell? Yeah, but they are also expensive. Here is a suggestion for how to turn this circuit into a keyboard controller. This circuit is currently completely untested. just built one of these from my copy of "The Terminator"! This thing is awesome; I used a 5 volt reg and a 2n3904 and am getting just under 5 octaves on the Saw VCO. You rule Nicolas! Which resistor would I need to sub in order to get a range control pot? How would I go about adding a gate and trigger out from your ribbon (or keyboard) controller in order to work with your modules? Thanks for the reply. What about a trigger, could I use a schmitt-trigger configured as a one shot? Also, semi-related to this thread. I see that the nicolas circuits use V/Hz, how do you determine the voltage needed to get a certain frequency? try the one shot below, i would think it should work. not sure how to estimate frequency. you could always use a trim pot to change the range. So I think I've figured out a good solution for a gate/trigger. If I have a comparator that compares the CV being played to 0V I could have it output a constant 5V for the gate as long as the note is on. For the trigger I found the CGS gate to trigger converter. I'm going to try this over the weekend to see how it work. Also found this one from MFOS, which uses the one-shot 40106.
fyi, used the cv output for both VCO freq and to gate a VCA, works just fine. would this work on a soft potentiometer? seems similar enough. Posted: Mon Mar 27, 2017 4:07 pm Post subject: Schematic for scaling of controller? How would I add a knob to adjust the scaling of this controller? Like the knob on an expression pedal that changes the output level? I'm trying to build this using a premade soft-pot (https://www.sparkfun.com/products/8681), wanting to use it primarily as a pitch controller for a Moog sub37, and I'd like to be able to adjust the scaling of it on the fly, so I can use it to control down to, say, a semitone, and up to the full range of the oscillators, with a notch in between to quickly get to a scaling that corresponds to a standard key board. It seems like it also needs a way to track with the octave buttons, so that when it's scaled to the keyboard, it's corresponding to the correct octave. Creatively, I want to be able to be playing along on the keyboard, and then use the ribbon to either 1)transition to playing entirely on the ribbon, 2)use the ribbon to perform a controlled glissando to another note, then go seemlessly back to the keyboard, 3)use a scaling knob in real time to perform multi octave glissandos from one note, then to be able to suddenly use the ribbon controller to adjust the intonation of the note I land on, or of the next note I play, and 4)use the scaling knob to make the controller immediately flexible as a controller for other destinations than pitch, especially since on the sub37, you can assign the destination of each CV input, and save that destination per preset. This may be too much to ask for. I don't know. I'm extremely new to circuit building, so any over-explaining is much appreciated, especially about what I need to do to select the correct components in relation to the resistance of this soft-pot. Does anyone have any tape scraps leftover from their build?????? I'm only asking to save some time fishing through thrift ship vhs tapes.